"This book was a pleasure to read. Jennifer's relaxed, conversational style is comforting and encouraging without the Pollyanna sugar coating. Whether she is discussing the perils of contract negotiation or the necessity of persistence, she provides a "no-nonsense" approach to the information at hand. Thank goodness! I can't tell you how many "informative" books I have read where the author spent three hundred pages dancing around the subject matter, when he could have given me the skinny in ninety." Industry Talk is out in the world as an e-book and the sales have started. It’s an exciting time for us at Apocalypse Ink Productions. We’ve already learned a few things along the way but nothing that hurt too much. Now, we are in the process of working with Lightening Source to get the soft copy of the book done. We project a release date of July 15, 2012 for the soft copy version. 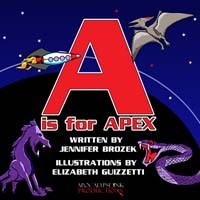 Release Date: May 10, 2012. 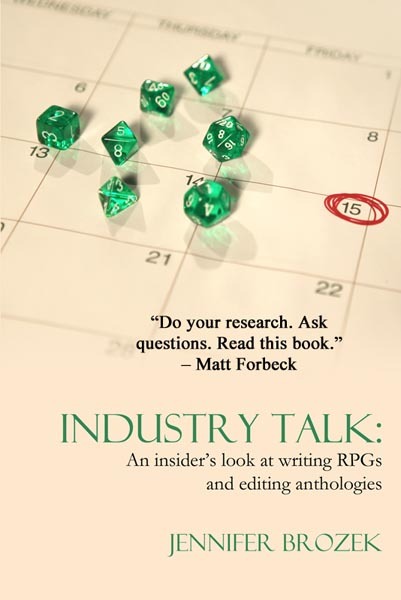 Apocalypse Ink Productions brings you INDUSTRY TALK, by award-winning editor and veteran freelancer Jennifer Brozek, a collection of her previously published columns Dice and Deadlines and The Making of an Anthology. This insider’s guide for freelance game writers and editors contains brand-new content addressing frequently asked questions like "How to pitch an anthology", and includes advice on managing a freelance career. Industry Talk is a collection of two previously published columns by Jennifer Brozek, Dice & Deadlines and The Making of an Anthology. The collection also contains brand-new content including step-by-step instructions on how to pitch an anthology and advice on managing a freelance career.